The perfect activity pack this Christmas! With the latest new Hazel Edwards release, Ho! Ho! Ho! 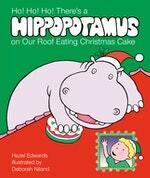 There's a Hippopotamus on Our Roof Eating Christmas Cake, we have the perfect activity pack this Christmas, including everything from Christmas colouring, gingerbread biscuit recipe, DIY Christmas tree decorations and gift tags.